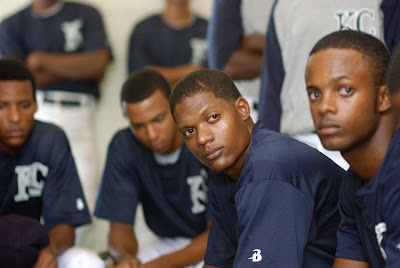 Sugar (Algenis Perez Soto) and his Dominican teammates at a baseball academy in San Pedro de Macorís. Sugar is more than a poignant, compelling film with an appealing cast of virtual unknowns and an interesting soundtrack featuring Chilean singer Gepe’s very cool Spanish version of Leonard Cohen’s “Hallelujah.” Arguably, it’s also an important movie—about language, the immigrant experience, and baseball. But I’ll leave that argument to other, more knowledgeable writers, like my TLR colleague J.C. Malone, who was born in San Pedro de Macorís, in the Dominican Republic, and has written, in both English and Spanish, a biography of that modest-size city’s best-known native son, Sammy Sosa. For those who don’t follow the game, it should be said that San Pedro is to baseball what Liverpool once was to rock ’n’ roll: a breeding ground and launching pad for raw talent. At least 30 big-league ballplayers were born there. And they all got their start in one of San Pedro’s baseball academies, where coaches and scouts molded them into potential professionals, creating for these local athletes an opportunity to be plucked from poverty and obscurity, deposited in a major-league spring-training camp, and given the chance to conquer America. But as every aspiring professional ballplayer knows, the odds of making it to the big leagues are slim, because pure athletic ability is only one factor in a wide array of physical, social, emotional, and intellectual skills that an athlete must master if he’s to have a real shot at success. Sugar makes this clear in the opening scene, which takes place in an academy classroom, where a group of Dominican ballplayers are learning to speak baseball English—“pop fly … ground ball … home run.” Later, in the locker room, they practice their English singing “Take Me out to the Ball Game.” Though they know almost all the words, they don’t seem to understand what a lot of them mean, and it’s touching to watch them struggle through the most difficult phrases, singing the song with feeling, as if it were a hymn. It’s this struggle to communicate in a foreign language that provides the film with some of its most entertaining moments. Most of them come courtesy of Miguel “Sugar” Santos (Algenis Perez Soto), a determined and intelligent, though immature, 19-year-old pitcher whose family is depending on his rubber arm and explosive curveball to lift them out of the slums of San Pedro—depicted here with unsentimental realism—with a big-league contract. When Sugar—so called because he likes desserts and has a “sweet” pitching motion—finds himself playing for the Swing, a class-A team in the Iowa hinterlands, he quickly learns enough English to order three different kinds of eggs for breakfast and to call an opposing player a “cocksucker,” a term he picks up from Brad (Andre Holland), a Berkeley-educated African-American shortstop with laid-back California charm, a firm grip on reality, and enough Spanish to exchange pleasantries with Sugar, calling him his hermano. Brad’s rudimentary Spanish is far more advanced than that of the Higginses, a family of devout Christian baseball fans who provide Sugar with room and board while he’s in Iowa. The mother, Helen (Ann Whitney), befuddles Sugar when she points to her washing machine and says, “You put the sopa in here.” She thinks she’s saying soap, though she’s actually saying soup. And her teenage daughter, Anne (Ellary Porterfield), confuses Sugar even more, taking him to a Christian youth meeting and later flirting with him, allowing him one innocent kiss, and then running away. Yet it’s the contrast between Brad and Sugar that brings into focus the dilemma at the heart of this film: What do you do if you don’t beat the overwhelming odds and make it to the big leagues? Brad plans to teach history. But Sugar, like the other Dominican players, has no real fallback plan and no education—he doesn’t even know who Roberto Clemente is. If he doesn’t make it to the big leagues, his choices are limited. He can either return to his disappointed family and the poverty of the D.R. or go to the Bronx and live in one of the largest Dominican communities in America, working at a survival job in the taunting shadow of Yankee Stadium. Communicating a visceral sense of what it’s like when your future dangles on the most delicate thread, the filmmakers do an excellent job of showing how Sugar and his Dominican teammates walk, with no net underneath, a physical and psychological tightrope between the D.R. and the American Dream. They show how easy it is to lose your stuff and let momentary failure shatter your confidence; how difficult it is to break out of a slump; and how painful it is when your life and your family’s well-being hinge on a dream that can vanish in the time it takes to drive a hanging curve over the left-field wall. This entry was posted in Algenis Perez Soto, Andre Holland, Ann Whitney, Anna Boden, baseball, Dominican Republic, Ellary Porterfield, Ryan Fleck, San Pedro de Macorís, Sugar. Bookmark the permalink.